The author of government accountability legislation wants a potential funding cut restored. State Senator Jon Erpenbach is not thrilled that Senate Majority Leader Russ Decker&apos;s version of the state budget would require the Government Accountability Board to ask the legislature for money – to investigate legislators. "You know, he&apos;s got a good point," says Erpenbach, referring to concerns that Decker voiced when the original legislation establishing the Government Accountability Board was debated in the state Senate two years ago. 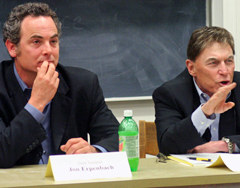 Erpenbach , a Dane County Democrat, and Neenah Republican Senator Mike Ellis wrote the GAB legislation to include so-called "sum sufficient" funding for investigations into potential wrongdoing by lawmakers. "But at the same time, I have a lot of faith in the folks who work at the Government Accountability Board. It&apos;s nothing they&apos;d abuse. They have a job to do, it&apos;s pretty clear what they&apos;re job is. I don&apos;t expect any abuse because they&apos;re free to do what it is they need to do." Accountability Board executive director Kevin Kennedy provided details on GAB investigations during the first eighteen months of the agency&apos;s existence. "We&apos;ve opened fifty one investigations, forty of those we conducted in house," said Kennedy. Contracted costs for the remaining eleven investigations were "about $45,552," according to Kennedy. "The concern is, if someone get&apos;s in there (GAB), and they have an agenda, what do we do then? But I think it will be pretty obvious if someone has an agenda," says Erpenbach. "Right now, I think they do a good job, and we need to restore the funding." That could happen in a Senate-Assembly budget conference committee, but if it doesn&apos;t Erpenbach says he&apos;ll urge Governor Jim Doyle to veto the funding cuts.